The potential benefits of traceability are well known and documented, as well as the impracticability of recovering and maintaining traceability links manually. Indeed, the manual management of traceability information is an error prone and time consuming task. Consequently, despite the advantages that can be gained, explicit traceability is rarely established unless there is a regulatory reason for doing so. Extensive efforts have been brought forth to improve the explicit connection of software artifacts in the software engineering community (both research and commercial). Promising results have been achieved using Information Retrieval (IR) techniques for traceability recovery. 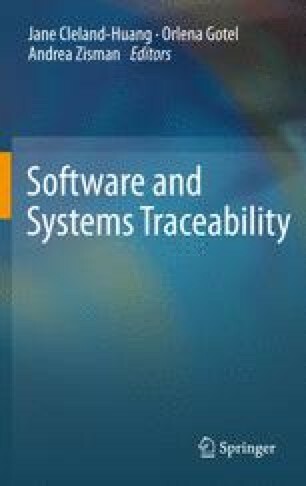 IR-based traceability recovery methods propose a list of candidate traceability links based on the similarity between the text contained in the software artifacts. Software artifacts have different structures and the common element among many of them is the textual data, which most often captures the informal semantics of artifacts. For example, source code includes large volume of textual data in the form of comments and identifiers. In consequence, IR-based approaches are very well suited to address the traceability recovery problem. The conjecture is that artifacts with high textual similarity are good candidates to be traced to each other since they share several concepts. In this chapter we overview a general process of using IR-based methods for traceability link recovery and overview some of them in a greater detail: probabilistic, vector space, and Latent Semantic Indexing models. Finally, we discuss common approaches to measuring the performance of IR-based traceability recovery methods and the latest advances in techniques for the analysis of candidate links. We would like to thank the anonymous reviewers for their detailed, constructive, and thoughtful comments that helped us to improve the presentation of the results in this chapter.